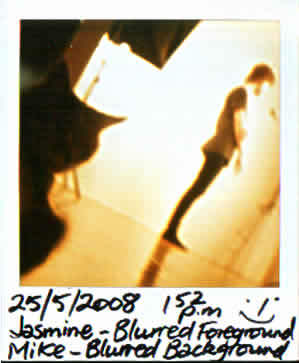 "Dear Diary - sometimes it's fun to squish your eyelids up and get that squinty thing happening where all the things around you turn into blobs of blurry...the shadowy masses are friendly and everything is reduced to its own unspecific essence..."
"Jasmine - Blurred Foreground. Mike - Blurred Background"
"Pop it on the Bookshelf. Thank you"